Moving into a new home is often an exciting adventure until you realize you have to fill the damn thing. And visiting the likes of Crate & Barrel or Bed Bath & Beyond will empty a wallet quickly unless you possess a tremendous amount of self-control. No one I know has that kind of discipline. Well, Crane and Canopy hopes to become the online solution for satisfying home good needs on a sane budget. The idea for Crane & Canopy sparked when founder Karin Shieh became a first-time home buyer. Her bank account made it difficult for her to furnish her house with the thoughtfully-designed, quality home goods she appreciated. She discovered her friends had gone through a similar experience. Being an entrepreneur, she discovered opportunity in frustration. Careful research inspired her to launch an Internet alternative to the traditional home goods store model. The online platform allows for a lot of work to be done in-house and eliminates a number of costs in the old school supply chain. Fewer hands, fewer middlemen, means lower prices for consumers. Launched in California, a warehouse in San Carlos stores goods brought directly from overseas factories in Asia. 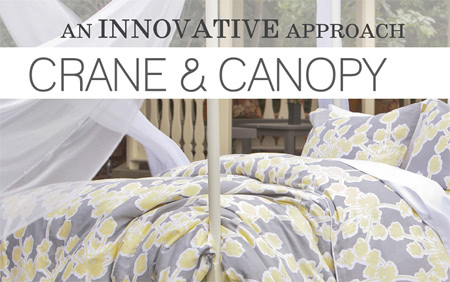 Given that the home goods industry presents many supply challenges across verticals, Crane and Canopy has started off selling bedding. Consumers tend to find the bedroom a particularly heavy pocketbook burden as well. With tough economic times, the bedding industry has taken a huge hit, making suppliers and factories more willing to work with Internet entrepreneurs than in the past. The time is right for a Crane & Canopy. Despite the doldrums, the internet component of the home goods industry continues to grow between 20%-30% annually. Shieh has her MBA at Harvard Business School. As an undergraduate, she served as President of the Harvard Undergraduate Women in Business. Prior to starting Crane & Canopy, she worked at Proctor & Gamble for eight years, leading a team in brand management and marketing. CEO, Co-Founder (and fiancé) Christopher Sun graduated from Stanford University before earning his MBA at Harvard Business School. 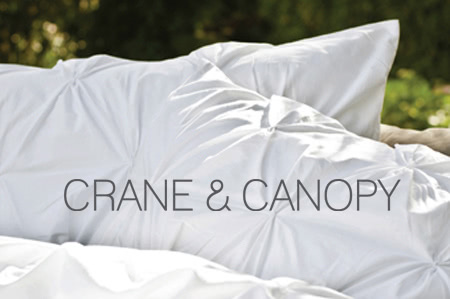 At the moment, Crane & Canopy offers 10 different collections of bedding. One highlight is a signature two-toned duvet cover that features hidden corner ties, an easy zipper also cleverly concealed, edge piping, original designs, and a perfectly-made bed appearance. Who doesn’t need to pull off that last illusion from time to time? (Seriously, check for bite marks. Pets love duvets. I had a tabby cat that chewed through two high-end numbers.) Guests may also purchase individual pillows, comforters, mattress pads, and pillow covers. When business takes off, the company wants to expand into the territory of side tables, accessories, frames, headboards, and more. Ahh, goodnight you princes of tech, you queens of startups.